As people continue to watch the videos in their social feeds without sound, it is increasingly important for publishers to find ways to capture their attention as they scroll through a mass of content, all of which is competing for their views. Text on video is a key way to do this, and editing suites such as Final Cut X and Adobe Premiere Pro can create eye-catching effects, but post-production can take up a lot of time, especially in a newsroom short on time, or for teams focused on breaking news. Using SRT files is a more effective way to caption videos on Facebook, because viewers will be able to choose whether or not they want to see them, and they can also be quickly edited if text needs to be altered in the future, without having to re-export the video. YouTube offers journalists a quick and effective way to produce SRT files by automatically linking your transcription to the correct timecodes in your footage. Simply upload your video to YouTube, type in your caption or transcription, and the platform will generate an SRT file. You can then upload it to Facebook, together with your video for smart, simple and flexible subtitles, explained Sanshey Biswas, mobile technology lead, Hindustan Times. "I initially wrote SRT files out myself, but this was time-consuming – YouTube does it for us. "SRT files work with any video format, look great, and aren't burnt onto the video – if people dislike text on their video, they can switch the text on and off whenever they want, which also means you can alter it at any point too." 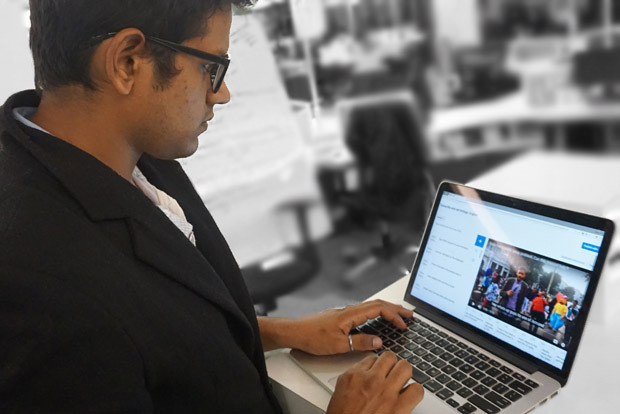 With a newsroom of over 750 journalists at Hindustan Times, captioning videos with SRT files makes workflows faster and easier. "It becomes very difficult if you want subtitles for multiple videos, and then you make a mistake and all your work is destroyed and you have to re-export it," he said. "But if you produce SRT files for your videos through YouTube, you can make a change very easily – it helps you get your work out faster, which is great for our mobile journalism workflows. "It's one part of the video production workflow that's simplified – you can even go and film another video while the subtitles are being created for you."